Preheat the oven to 200°C/395°F. Quarter the pears, remove the core, and cut into fine strips. Pluck thyme from the stalks. Roughly chop walnuts. Spread the pastry onto a baking sheet lined with baking paper. Distribute the creme fraiche evenly over it. 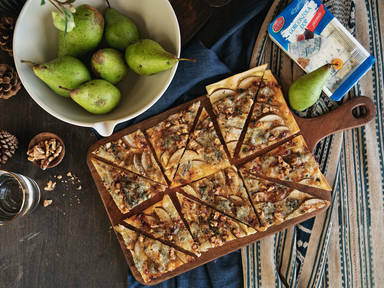 Spread the pears onto the pastry and, using your hands, crumble the Gorgonzola over the top. Sprinkle with walnuts and thyme, season with salt and pepper, and drizzle with honey. Transfer to the oven and bake at 200°C/395°F for approx. 15 – 20 min. Cut into pieces and enjoy!